I can't even begin to describe how much this simple line blessed me Tuesday. On a day when I received news of two tragedies - a close friend who lost her mother-in-law to cancer, and a teenage cousin who lost a friend in a car accident - it was the reminder I needed that my Savior holds it all in His hands. 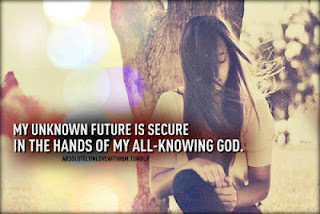 I am secure in Him.